The Majestic Imperator, legendary Imperial train of the Austro-Hungarian monarchy, is now again rolling across central Europe. On these luxurious antique carriages completely restructured can be also attached to a regular train, today the traveller can enjoy an exclusive voyage between two of the most beautiful cities of Austria, Salzburg and Vienna . Or a magical tour of Vienna by night with dinner. Once a board, as was customary for the Emperor and Empress, a red carpet welcome with champagne awaits you at your carriage. You will be spoilt by our highly qualified staff, the Chef du train and stewards in uniform will personally see to it that all your wishes are met. 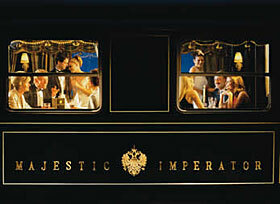 While travelling you can delight in a champagne breakfast, lunch or even dinner, depending on what hour of the day you travel, as you explore all the carriages, you will find intricate Italian inlaid woods, polished brass furnishings, Persian rugs, colourful fabrics from the original imperial weaving tables and many authentic pieces of art. Lean back and relax as your senses are filled with the music of the great composers, who called Vienna their home. Witness firsthand their source of inspiration as we pass through the fabled Vienna Woods and gaze upon the blue Danube and its century old vineyards. Take advantage of this Magic Experience that once only the rich and noble could afford.